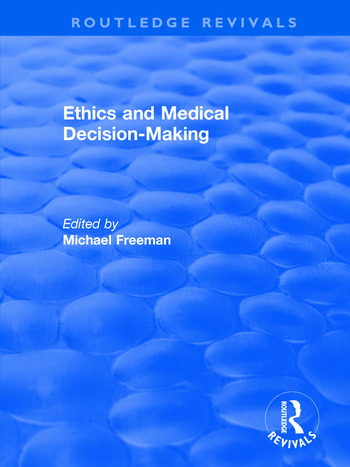 This title was first published in 2001: Ethical thinking about medical decision-making has roots deep in history. This collection of contemporary essays by leading international scholars traces the development of modern bioethics and explores the theory and current issues surrounding this widely contested field. Contents: What is Bioethics? : Ethical and clinical research, Henry K. Beecher; Medical ethics and etiquette in the early Middle Ages: the persistence of Hippocratic ideals, Loren C. MacKinney. Bioethics and the Law: Bioethics and law: a developmental perspective, Wibren van der Burg. Bioethics and Religion: Religion and the secularization of bioethics, Daniel Callahan; Religion and moral meaning in bioethics, Courtney S. Campbell; Can theology have a role in 'public' bioethical discourse, Lisa Sowle Cahill; Bioethics and the contemporary Jewish community, David Novak; What can religion offer bioethics?, James P. Wind. The Principle-Based Approach: Principles and particularity: the roles of cases in bioethics, John D. Arras; Moving forward in bioethical theory: theories, cases and specified principlism, David DeGrazia; Specifying norms as a way to resolve concrete ethical problems, Henry S. Richardson; The tyranny of principles, Stephen Toulmin; A critique of principlism, K. Danner Clouser and Bernard Gert. The Absolute Rule Approach: Medalist's address: action, intention and 'double effect' G.E.M. Anscombe; Who is entitled to double effect?, Joseph Boyle; Moral absolutism and the double effect exception: reflections on Joseph Boyle's 'Who is entitled to double effect? ', Alan Donegan. Utilitarianism and Bioethics: Consequentialism, reasons, value and justice, Julian Savulescu; Justice and equal opportunities in health care, John Harris. Virtue Ethics: Varieties of virtue ethics, Justin Oakley; Euthanasia, Philippa Foot; Virtue theory and abortion, Rosalind Hursthouse; Methods of bioethics: some defective proposals, R.M. Hare. The Ethics of Care: 2 perspectives on self, relationships and morality, Nona Plessner Lyons; The role of caring in a theory of nursing ethics, Sara T. Fry; Clinical ethics and nursing: 'yes' to caring but 'no' to a female ethics of care, Helga Kuhse. The Case Approach: Getting down to cases: the revival of casuistry in bioethics, John D. Arras; Casuistry: an alternative or complement to principles?, Albert R. Jonsen; The priesthood of bioethics and the return of casuistry, Kevin Wm. Wildes. Cultural Diversity and Bioethics: Can ethnography save the life of medical ethics?, Barry Hoffmaster; Intersections of Western biomedical ethics and world culture: problematic and possibility, Edmund D. Pellegrino; Judging the other - responding to traditional female genital surgeries, Sandra D. Lane and Robert A. Rubinstein. Sociology and Medical Ethics: The contributions of sociology to medical ethics, Robert Zussman; Moral teaching from an unexpected quarter: lessons for bioethics from the social sciences and managed care, James Lindemann Nelson; Name index. Michael Freeman is Professor of English Law at University College London. His research interests are in cultural pluralism in particular in relation to the rights of children and in medical ethics particularly in relation to medically assisted reproduction.He has published in the areas of Family Law, Child Law and Policy, Children's Rights, Medicine, Ethics and the Law and Medical Law, Jurisprudence and Legal Theory. He is the author of over 40 books, editor of a large number of international journals and a Fellow of the British Academy.